I volunteered to help out with crafts at our church's Vacation Bible School this summer. Our church is small, and I needed crafts that were simple and appropriate for all ages. 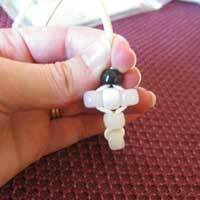 I was happy to find several great craft ideas online, including a Beaded Cross Necklace. Glue Dots helped make this project easy to assemble and quick because the necklace required no drying time. One of the VBS lessons had the theme, "Jesus, our Savior, says, 'Believe!'" We crafted "I Believe" beaded cross necklaces and key chains to go along with this lesson (original idea from Sunday School Network.com). To make the project more memorable and correspond with our lesson, we used color changing UV beads from Steve Spangler Science (they are the same size as Pony Beads). These beads look white but turn different colors when placed in the sun. I held up a bead before we made the craft and asked the kids if they would believe me if I told them that the white bead was actually a blue bead. Believing takes faith. (Now faith is being sure of what we hope for and certain of what we do not see. Hebrews 11:1 NIV) Using color changing beads is the perfect way to illustrate this concept. 1). Cut cord to desired length. Slide the yellow bead to the center of the length of cord. 2). 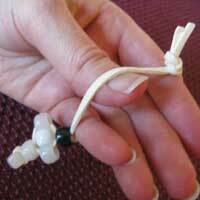 Fold the cord in half and place the green bead over both ends of the cord. Slide the green bead down until it touches the top of the yellow bead. 4).Using the three bead section from the above step, slide the red bead onto the left strand of cord and slide the blue bead onto the right strand of cord until this center row touches the other beads. 5.) 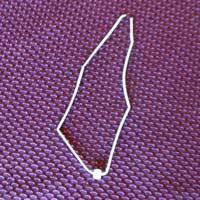 Place the black bead over both ends of the cord and slide all the way down to meet the other beads. 6.) 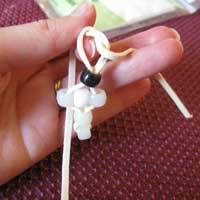 Tighten all the beads together and tie a knot at the top of the cross. 7.) Tie another knot at the top of the necklace or key chain decoration. 8.) Take the necklace outside on a sunny day and watch the beads change colors. 9.) 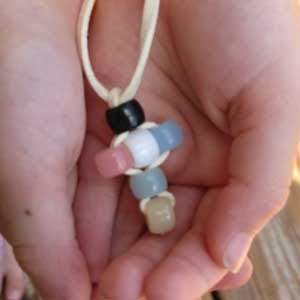 Provide each child with a card that explains what each bead color represents. WHITE represents the cleansing of our sins. GREEN represents growth in our faith. GOLD represents eternal life with Jesus in Heaven. 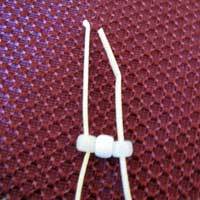 I ran across one problem with the beaded cross craft directions at Sunday School Network.com. The center row of beads is hard to assemble and keep together so I revised the directions to include a new gluing method using Glue Dots. 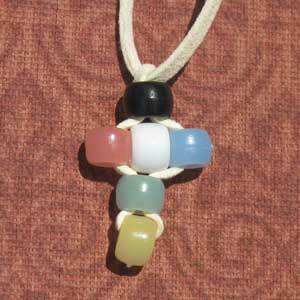 A note on the website suggested gluing the three beads that make the center portion of the cross together beforehand. 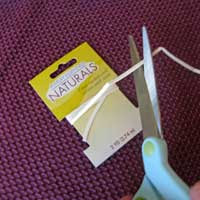 I tried doing this with both white and crafting glue, but the process is time consuming and a little tricky. 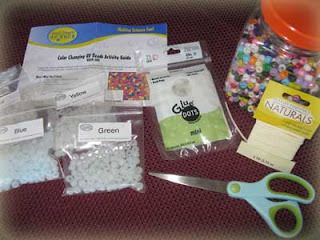 I didn't want to use a glue gun because I was afraid that the heat would alter the chemistry of the color changing beads. Then I remembered Glue Dots samples that I had recently received as part of a TwitterMoms promotion. The Glue Dots worked like a charm and required no fussing beforehand and no drying time! The kids applied the Glue Dots themselves. And, at least for this project, the Glue Dots held the beads together better than the liquid glues. 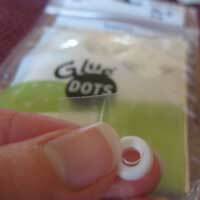 Who knew Glue Dots were so handy? I plan to keep a plentiful supply in our craft drawer for our future crafting projects. I used to make these necklaces when I was little, but I love your spin on the color changing beads, and the lesson. Very clever. 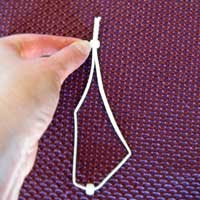 how to make a beadded cross neckless with cord. Thank you so much for posting this!! You saved my craft night at VBS tonight! 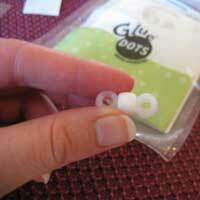 We didn't have those color changing beads, and before hand I hot glued those three beads together. The kids loved them! Done approx. 40 necklaces. Thanks and God Bless!